Dario Agostini, ice cream dealer, tenant/occupier of a shop in Glasgow St. and Alfonso Agostini, confectioner, tenant/occupier of a store in Princes Place. The available valuation rolls end 1935, so I can't tell you if and when they took over the pub. The North Ayrshire Directory -1935-1936-1937, presumably published in the latter year, shows DARIO AGOSTINI as a restauranteur at 55-57 Princes Street; and ALPHONSO AGOSTINI, also as a restauranteur, with interests at 26-28 Glasgow Street and 33 Princes Street. At the same time JAMES EMMERSON, is still shown as a publican at 2-6 Princes Place. I was informed by Tom McGrattan at the weekend that Aldo Agostini was a barman for Emerson before taking on the pub himself. I think I might have nailed this. After much online searching I ended up in the British Newspaper Archive. 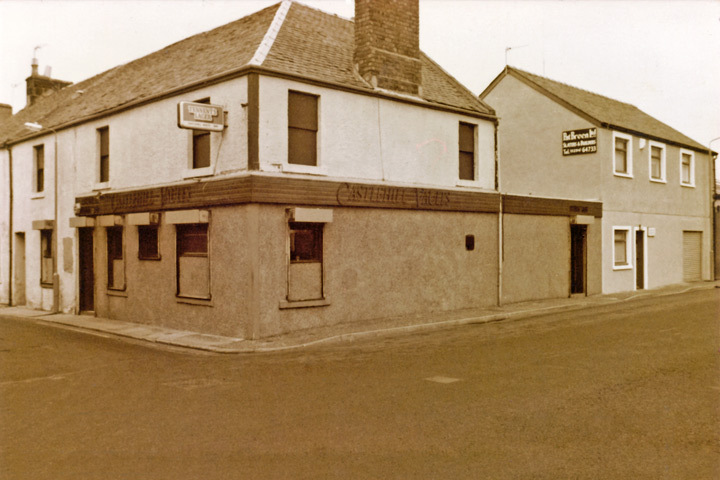 I found not only that the Ardrossan and Saltcoats Herald archive is referencing the Castlehill Vaults as far back as the late 1800's, and indeed carrying adverts for the pub, but the publication dated Friday 14th April 1899 references the Licensee as a Mr Thomas Campbell. If the mirror does indeed go back to those days it is a very interesting Artefact indeed. As I said it was uncovered during renovation work in the mid 1980's and was not known about by Alfie, the then owner, and also not known when his father was the owner. So there is a chance it links back to the days of Mr Campbell. Could this have been an attempt by Mr Campbell to establish some sort of new identity for the Vaults (tho' obviously not sucessful) by associating it directly with his own name, so that people would eventually come to call it just "Campbell's", i.e., like "Rankin's". We've all seen other pubs with a big mirror behind the bar but with the official pub name on it, not the licensee. The first mention of the name Castle Hill Vaults I could find was in a 1926/27 directory. This was after Mary Campbell had died and John Shanks became manager. It's very likely the pub was formerly known as Campbell's, and John Shanks changed the name to Castle Hill Vaults. On the evening of Saturday last (22 May 1897), in the Castle Hill Vaults, Ardrossan, Mr Robert Wilson, fireman on the Glasgow and South-Western Railway was made the recipient of a handsome marble timepiece by his fellow workers on the occasion of his marriage. Mr Harry Northcote presided and in a few well-chosen and appropriate remarks made the presentation. Mr Wilson suitably replied. An enjoyable evening was thereafter spent in song and sentiment. The photo below was taken in the early 1970s.